Taking time off for the Holidays is not like taking time off for summer vacation. In this case, everyone else will probably be away next week as well. You don’t have to worry as much about the work you’ll miss, since not much work is likely to be done. 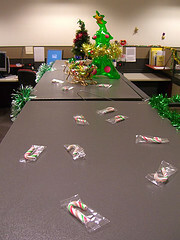 Still, preparing ahead of time for your Holiday absence is a good productivity idea. You want to be able to hit the ground running after the new year, no matter how long you’ve been away. Here are 6 quick tips to help you avoid a post-Holiday work hangover. Decide now if you’re going work at all during the holidays. Some people bring as much home with them as possible, and some people bring nothing. Unfortunately, most of us fudge to somewhere in between. But even if you’re only planning on “checking in occasionally ” you should prepare yourself to have all the info and access you need. Set up your remote desktop system and check that it’s working at home or on your laptop. Begin transferring any files or contact numbers you think you’ll need. Make sure anyone who needs to get in touch with you has your contact info at the ski lodge. In other words, if you’re going to do any work at all, prepare like you’re going to be in touch full-time. Make a to-do list for when you return. If you’re planning on checking out completely, this is the most important thing to be done. You know what needs doing now, but will you remember in a week? A simple reminder list will go a long way to helping you hit the ground running. Set your out-of-office email notifications. Don’t forget an emergency contact in case it simply can’t wait. Set your voicemail to an out-0f-office message. Make sure you know how to retrieve these messages remotely, just in case. Cull your inbox. By the time you leave for the Holiday break, make sure every email has been responded to, filed or deleted. Don’t leave any issues lingering. You want to came back to work and find that the only items in your inbox are new communiques. No catching-up necessary! Clean your desk. Mostly for your own sanity. New year coming, right? Imagine walking in the first morning back to a mental and physical clean slate.